How best to make Edgerstoune Road a safe street? That question has been concerning neighbors, who have held several meetings with Princeton municipal staff, and engaged in a vigorous online debate that has now involved Mayor Liz Lempert as well. After some discussion, the town has installed three new streetlights (see photo above). Some neighbors are calling for a sidewalk as well, but this is fiercely opposed by other residents who say ‘neighborhood character’ trumps any potential safety benefit. 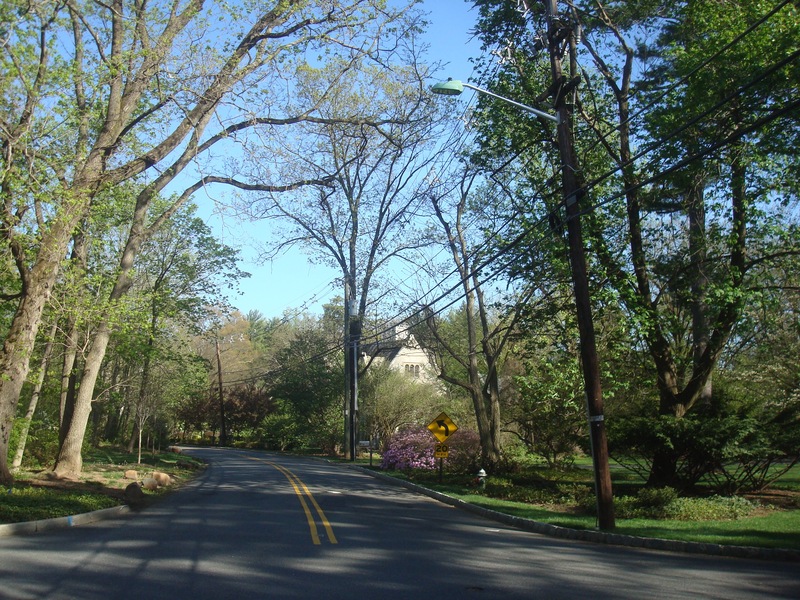 Edgerstoune Road is currently a ‘missing link’ in Princeton’s sidewalk network. 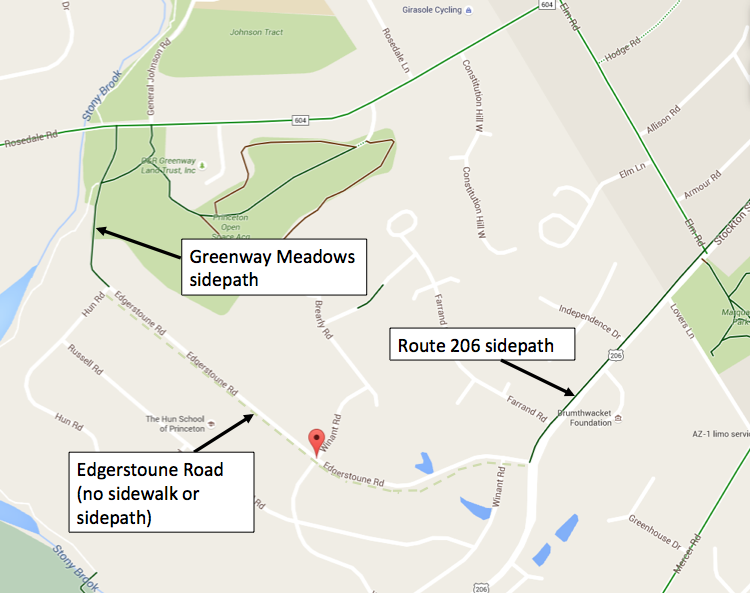 At either end, it meets existing paths on Route 206 and in Greenway Meadows. But Edgerstoune itself has no facilities for pedestrians. Walkers must take their chances in the road, and though traffic is light at weekends, at peak times there are significant numbers of cars and frequent speeding. Many parts of the road are poorly lit, making it hard for drivers to see people walking in the road. Map of western Princeton showing Edgerstoune Rd, with disconnected paths on either side (click to expand). 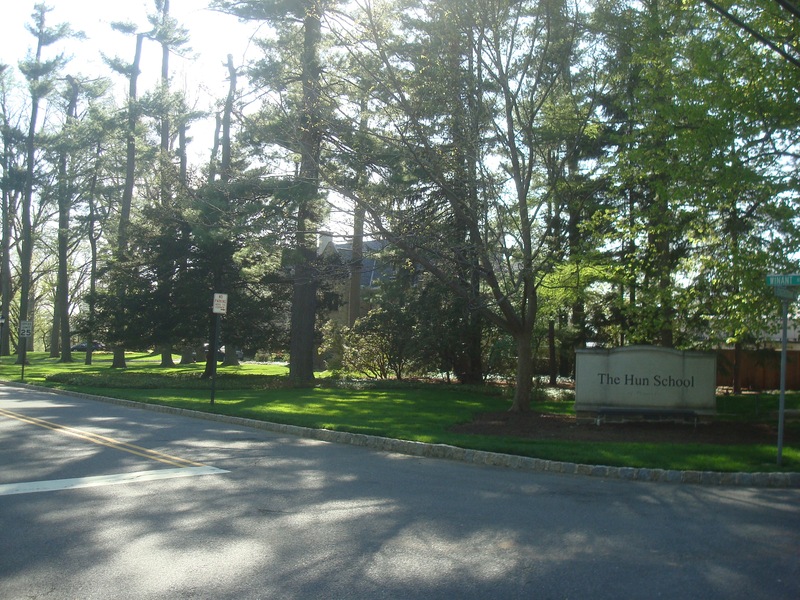 What’s worse it that Edgerstoune Road is the main entrance to a school: The Hun School of Princeton, with over 600 students. There is currently no reasonable way for them to safely get to school without use of a motor vehicle. Even students who live a few doors down along Edgerstoune Road must be driven, because parents don’t want them to risk walking in the road with fast-moving traffic. Despite the apparent benefits of street improvements such as lights and a new sidewalk, several residents have strongly objected on the local ‘edgerstounerdneighbors’ email list. The improvements were called ‘impractical and expensive’, and neighbors who have advocated in favor have been called ‘a vocal minority’. Some local residents called on Mayor Lempert to explain what was going on, and the Mayor responded in a lengthy email last week. Lempert praised the “sense of place” in the neighborhood, and acknowledged objections to new street lighting among some in the wider area. But Lempert justified new streetlights, saying that “the safety desires of the immediate neighbors are being given higher priority”. 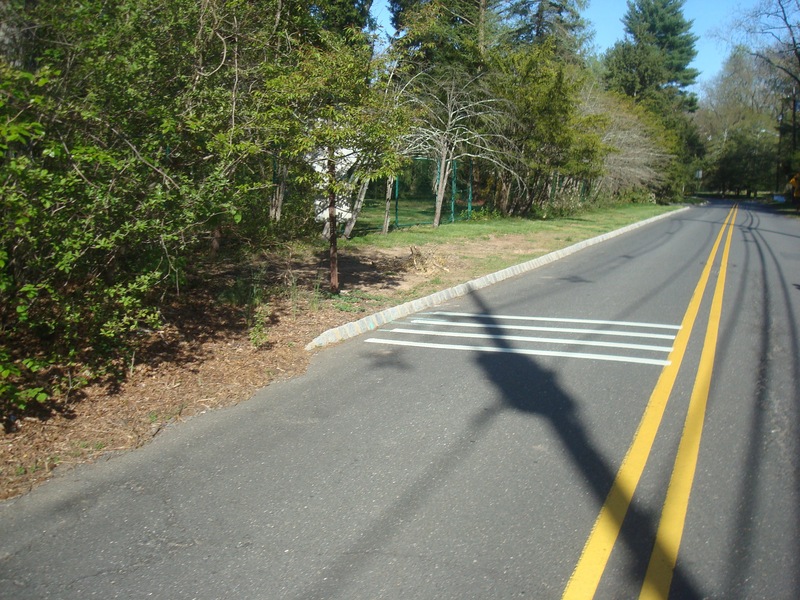 ‘Rumble strips’ – newly installed by the town to try to reduce speeding (click to expand). 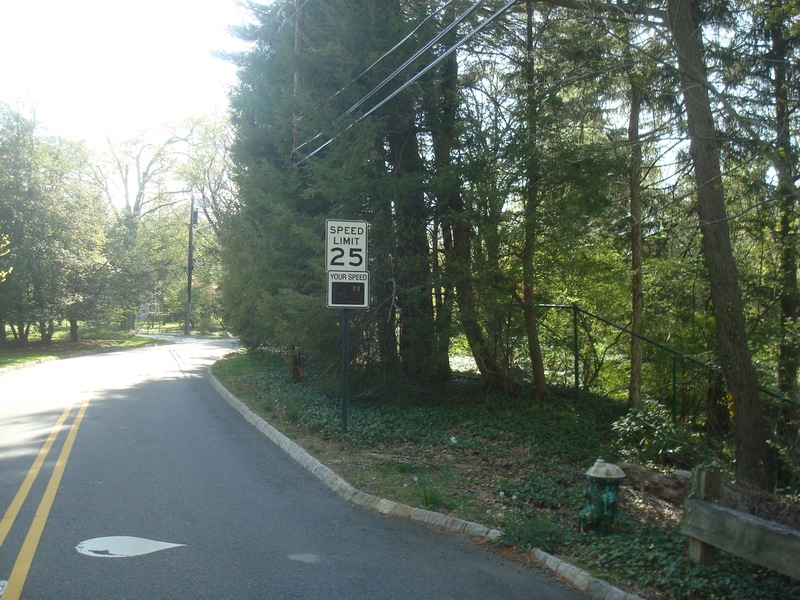 Temporary speed display sign – another traffic calming measure used on Edgerstoune (click to expand). The town of Princeton has a sidewalk masterplan, but this masterplan does not list Edgerstoune Road as a potential site for a future sidewalk. Instead, a somewhat circuitous sidewalk route was planned to run between Greenway Meadows and Route 206 via Hun Road and Russell Road. It’s not clear that neighbors on these streets would be more receptive to a sidewalk than residents on Edgerstoune Road, and the link remains unbuilt. For now, as neighbors continue the discussion, pedestrians in the area are advised to exercise caution. This entry was posted in Complete Streets, People, Princeton, Walking and tagged Complete streets, Princeton. Bookmark the permalink.